Passion and Warfare was commercially successful. Boosted by the fan-favorite video for "The Audience is Listening," which received heavy rotation on MTV, the album peaked at No. 18 on the Billboard 200—no small feat for an instrumental guitar album. 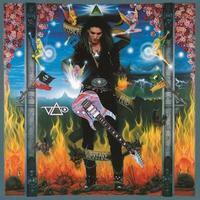 This crossover appeal set the stage for Vai's continued successes throughout his career. This 180-gram clear vinyl limited edition of Passion and Warfare, newly remastered from the original analog tapes, includes four newly discovered recordings from the album sessions:"Love Elixir," "We Are One," "As Above" and "So Below." Known for his intense, virtuosic and instantly recognizable guitar style, Vai—a onetime student of artist Joe Satriani—rose to prominence in 1980 when Frank Zappa invited the 20-year-old guitarist to join his touring band. He has since performed with a variety of acts from Alice Cooper and Ozzy Osbourne to Joe Jackson and heavy metal group Alcatrazz (where he replaced fellow virtuoso Yngwie Malmsteen).